Between taxation and inflation, you’d think the government would have maxed out on plunder. Nope. 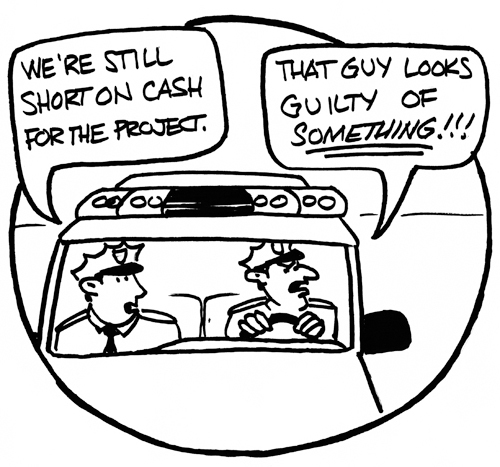 Civil Asset Forfeiture is finally making the news. I hear those two phrases far too much. (Once is already enough to get my blood boiling!) The truth is, it doesn’t matter if you do or you don’t have anything to hide. And it doesn’t matter if you do or you don’t follow the law. The people doing the searching and prying are no different than the people enforcing the laws. This isn’t the first time – and it most certainly and sadly won’t be the last time – I’ve discussed civil asset forfeiture. It’s something that doesn’t happen out in the open, and unless someone decides to drop the Kanye West & Kim Kardashian story to bring stories like this to light, it goes largely unnoticed. What’s really sad is that some of the most honest and in-depth reporting on this horrible issue is comedian John Oliver! Chances are, if you’re reading this, you already have an aversion to taxes. I regard it as nothing short of theft. That we call it taxation rather than theft because of some a righteous list of expenditures upon which those funds will be spent, only shows how linguistically gullible some of us are. Each politician finds new and inventive ways to tax us too. Sales tax, utility tax, fuel tax, income tax, property tax, excise tax, death tax, and I’m sure there are others I’ve missed. Then there is civil asset forfeiture. Whereas taxes have largely been accepted and engrained into our daily existence, civil forfeiture has not. This is when agents of the state arrest your property on suspicion that it was a party to, or a result of criminal activity. You read that correctly: they arrest your property. They charge and sue your things… inanimate things. Preposterous as it sounds, your things don’t have rights, which means they are presumed guilty and must be proven innocent. So, for example, if all your worldly belongings are taken by the state, you have to go to court and prove they were never involved in or a result of a crime. You have to prove something didn’t happen. What’s worse is that in many local cases, you don’t get a judge and jury. Because you – the person – aren’t the one on trial. You are entitled to a trial by jury. Your THINGS on the other hand, aren’t. You don’t get a judge, you get the District Attorney. There was a man who bid on a car on eBay, George Reby. He had the cash in hand to make the purchase and was literally on his way to do just that. He was pulled over by cops on his way for speeding and was asked how much cash he had on him. He answered honestly: $22,000. They asked to search his car, and he consented because “if you have nothing to hide, you have nothing to fear” right? WRONG. They took the money despite the evidence he provided on the spot corroborating his claim of buying a car off eBay. Only because the local news station started to pry and ask questions did the city agree to return his money on condition that he waive his Constitutional rights and agree not to sue. Philadelphia has brought in over $64 million over the past decade in civil forfeitures alone. That’s over $6 million in revenue or nearly 20% of the District Attorney’s annual budget, and 40% of which pays for prosecutor salaries. These are just two cases in just two cities. Click here to see the Washington Post’s findings. The scale at which these forfeitures have been happening should have every single individual residing within American borders seething! Are you shaking your head in disbelief yet? Well, there’s MORE, and if the above has you shaking your head, then what’s next will likely give you whiplash. It’s not just the local cops, it’s the IRS. That’s not shocking. What is just a devastating blow to my faith in humanity is the targets. Who do you imagine being the subjects of seizures by the IRS? Human, arms, or drug traffickers? On paper, civil asset forfeiture laws were created for these very people. With the exception of thieves and human traffickers, I certainly don’t think the others listed should be considered criminals so much as entrepreneurs, but because of the moral wars our government insists upon waging against its own citizens, you have a widely cast net that inevitably ensnares many innocents. Take Carole Hinders of Arnolds Park, IA. She’s been a restaurateur for about 40 years. Until recently, she’s never had a single run-in with the law. Last year she was advised that the IRS confiscated $33,000 from her account. What was her crime? She was never charged with one. She, like many others, was told by someone else that if she keeps her deposits below $10,000, it saves a lot on paperwork. Ms. Hinders was told by her mother, others have been told directly by bank professionals. Here’s the kicker: banks aren’t required to tell you it’s illegal to deliberately avoid the $10,000 threshold unless you specifically ask – in which case they will give you a pamphlet – but they can advise you to do so because simply making a deposit below $10,000 unto itself is not illegal. In none of the examples were the people ever charged with a crime, much less found guilty of one. These aren’t the hardened criminals these laws were designed to apprehend. These are middle-class, law-abiding, tax-paying citizens. Click here to schedule a consultation today! If there’s a way to protect you and your assets from theft, confiscation, forfeitures, or taxes (but I repeat myself), now is the time to find and do it! What Deference Does it Make? In the comments from “stevieod says,” he states that “… unless Americans vote for a more reasonable (proven criminal activity) standard of government behavior…”. All government behavior is criminal because it is based on violence. Some criminal behavior is worse than others, but it is all criminal. Reforming government never works for the same reason that “reforming” the mafia wouldn’t work. 100% agree. We no more need a replacement for the current government than we would need a replacement for the fire in our homes or the cancer in our bodies or for slavery. If something is destructive and wrong, you simply pluck it out and do away with it. So the 4th Amendment is no longer a protection for American citizens. GOVERNMENT in the guise of law enforcement can now expropriate whatever they want under the most specious of reasons. The next step as we all know too well is outright expropriation of Americans assets for no reason at all. I don’t know when Americans voted for this outrageous activity, but unless Americans vote for a more reasonable (proven criminal activity) standard of government behaviour, all of our assets are now up for grabs by government.